Consistency. Quality. Creativity. Three elements which professional chefs balance with great care and skill every day. It is our mission to help chefs and other food professionals to achieve all these elements in perfect harmony. That is why we created the CHEF® Signature range, made by chefs for chefs. Modern gastronomy knows no boundaries and CHEF Signature is a testament to this fact. We worked in partnership with the Chef2Chef team in Europe. The team is made up of expert chefs from leading restaurants across the United Kingdom, Belgium, Germany, Denmark, France and the Netherlands. Each chef providing valuable insight, knowledge and development in the range of products. Doing this allowed us to ensure that every aspect of CHEF Signature would serve a crucial purpose in the development of modern menus. We wanted to help chefs to incorporate a personal touch to their cooking and create dishes that become synonymous with their name or establishment. With a total of 6 products in the range, CHEF Signature allows for creativity and experimentation in the kitchen. By providing quick and complex flavours, each product speeds up the process of recipe development. 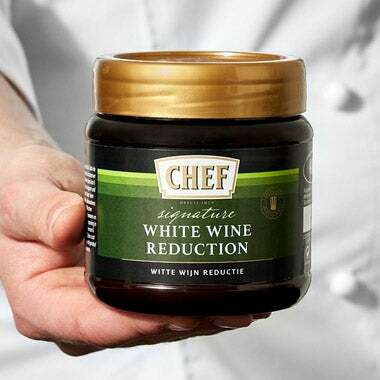 CHEF Signature facilitates creativity by being easy to dose and apply in either paste or liquid form. The CHEF Signature range both remains true to trends whilst simultaneously facilitating the traditional principles of cooking. The core range of pastes and liquids reach across the culinary spectrum and seamlessly blends into all stages of the cooking process. This includes simple application in seasoning foods and as a foundation for delicious stews, marinades and dressings. The only limits in using CHEF Signature is your creativity. Some of our chefs have used the pastes and liquids in a range of seasonings, flavourings and sauces. We have also seen the creative use of the range in cold recipes including mayonnaises, dips and dressing. We have also seen application in adding finishing flavours to soups, sauces and stews such as white wine reductions with leek, cooking risotto’s with lemon paste and even in deserts like winter berries with red wine reductions. Why not buy, test and experiment with the CHEF Signature range now?